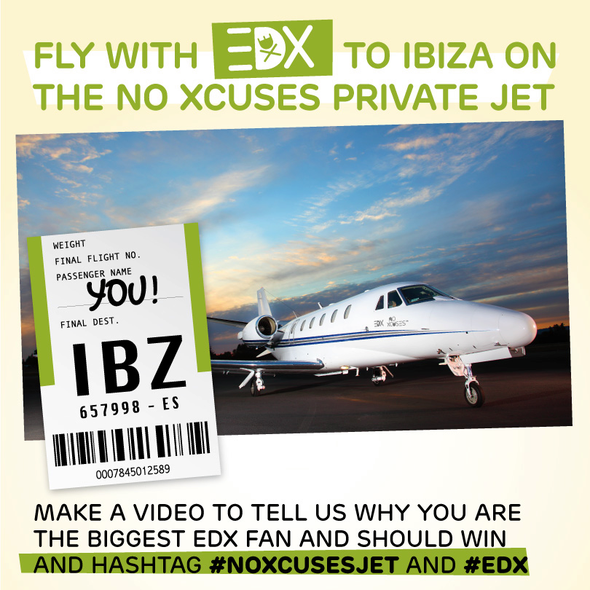 Swiss progressive house producer, EDX, is giving fans a chance to win a top summer vacation including a possible once-in-a-lifetime opportunity to fly with him to Ibiza on his No Xcuses private jet, exclusive VIP accommodations, and more. The winning fan will travel and hangout with EDX, and also join him for the festivities in Zurich for Street Parade, the biggest street festival in the world, and at his NoXcuses Afterparty on August 10. Once getting to Ibiza after a luxury flight, the fan will spend the day backstage for a VIP experience during EDX's gig at Avicii's party at Ushuaia. Create a video of up to 60 seconds to convince EDX why you are his biggest fan and should be the one winning this trip, hashtag #NoXcusesJet and #EDX and upload it here: http://on.fb.me/13s1Ura. EDX: "I want to offer my fans a once-in-a-lifetime opportunity that reaches beyond a backstage experience and allows them to see all the unique and fun things that happens before and after as well. Joining me at the world's biggest EDM parade in Zürich, the NoXcuses Party in my hometown, and then on a private jet with my crew to Ibiza at Usuahia's Avicii Sunday Event is the perfect experience I could offer to the music lovers out there. They are the biggest reason I get to do all this. I get so much love during every gig and now it was time to give something back in return! NoXcuses!"